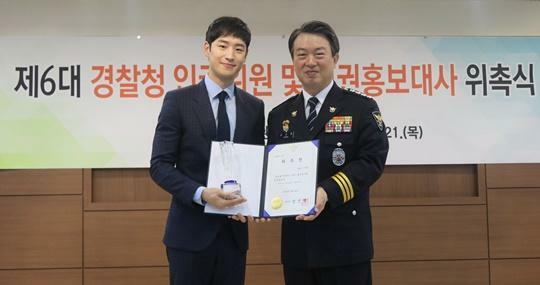 Lee Je Hoon was appointed as National Police Agency's Human Rights Ambassador. On April 21st, actor Lee Je Hoon was appointed as National Police Agency's Human Rights Ambassador. Recently, Lee Je Hoon played in drama 'SIGNAL' as police 'Park Hae Young, and received a great number of compliments for his fabulous performance. Lee Je Hoon is the first Ambassador of National Police Agency's Human Rights Campaign, and he is going to participate in many different human rights promotion activities. After getting appointed, Lee Je Hoon said, "I feel thrilled for getting appointed as he Ambassador, and I will do my best in order to make as much contribution in human rights promotion." The chief of National Police Agency said, "I am very pleased to appoint Lee Je Hoon as the Human Rights Promotion Ambassador, and our agency will do our best to improve protection of human rights as much as possible. The chief went on, "Human rights protection is one of the many duties of police, and I would like to ask Lee Je Hoon to become the bridge that connects the National Police Agency with Korean citizens." Meanwhile, Lee Je Hoon played in 'Phantom Detective' recently, and he is now waiting for the official release of the film.